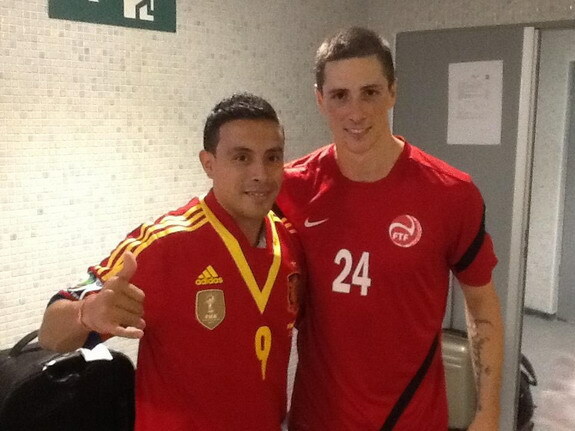 Tahiti player Efraín Araneda, who isn't technically in the Confederations Cup squad but has travelled to Brazil as a first reserve, has achieved his dream of meeting Fernando Torres and swapping shirts. The story began a while back when Araneda, who works in Tahiti as a tourist guide, greeted Torres at the airport in the island's capital, Papeete, as the striker went there on his honeymoon in 2007. "I remember him was about to leave Atlético Madrid and asked if he would go to Real Madrid or Barcelona. I said join Real or you're crazy!" Arenada told MARCA before the game against Spain. "Those days were wonderful. I used to greet people with a flower wreath when they arrived to the airport. I received Torres, took him to his hotel and took him back to the airport for his departure. In fact, I remember he left his honeymoon because he had to go sign for Liverpool. "What I'd like is that Fernando gives me his shirt on Thursday after the game. For me it would be a dream to remind him (of our past meeting) and give me his shirt!" And it was a dream came true for Araneda as he was allowed to enter the dressing room and swap shirts with Torres, thanks to Vicente del Bosque's intervention. He said: "We were all running to the dressing room to ask Spain shirts, but FIFA official threw us away. "My luck was that I had already spoken with Vicente del Bosque and he made it happen. "There I saw Torres and he gave me his shirt. He said he wanted to return to Polynesia and I gave him my contact." Araneda was not only received the Spanish striker's shirt. In addition, he also took pictures with almost all of his idols in the Spain squad.